The Scottish Crannog Centre on Loch Tay at Kenmore. Airlifted by helicopter from Highland Perthshire to hospital in Dundee in a matter of minutes, one man has more reason than most to be thankful for Scotland’s Charity Air Ambulance. Now the Scottish Crannog Centre on Loch Tay is organising a fundraiser for SCAA after the Scone-based helicopter helped save the life of one of their volunteers. “We all know just how invaluable the emergency services are but the staff at the Scottish Crannog Centre, and one of our volunteers in particular, found out just how priceless they are last week,” said a spokesperson for the centre. 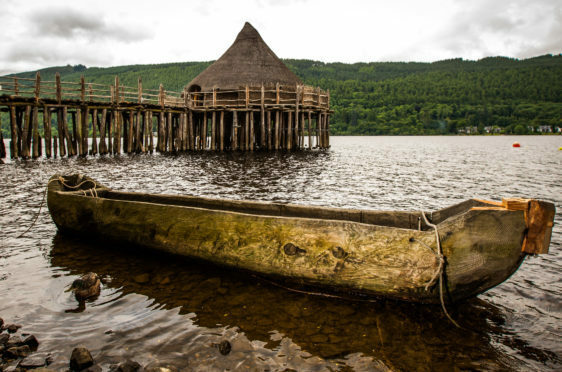 “The team of staff and volunteers were rebuilding an Iron Age style shelter when one of the volunteers, Dave Mill of Fearnan, was taken ill.
Dave Mill at the crannog centre. 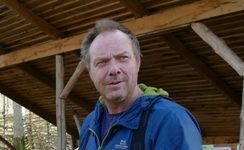 “Dave, who is ex-military and has led expeditions to the Arctic, informed his colleagues that there was something wrong and the emergency services were called. “Literally within minutes, one of Loch Tay’s first responders was on site followed quickly by an ambulance and the air ambulance. “Within 30 minutes of being taken ill, Dave was on board the helicopter with a suspected heart attack, eight minutes later he arrived at Dundee and within two hours he was in the operating theatre. “Less than a week later, Dave is at home with his wife and family after having two stents fitted at Ninewells Hospital. “The centre is extremely grateful to everyone, particularly Susan Duncan-Miller, the Loch Tay First Responder, the guys from the ambulance service and the crew from the air ambulance. The centre plans to hold a fundraiser for SCAA later in the summer but the details are yet to be finalised. They would also be delighted give free tours of the crannog to any of the people who helped Mr Mill when he was taken ill.